Here is a special Mouth Watering Mondays. This recipe I shared on BonBon Break awhile back and now I have it for you here today. 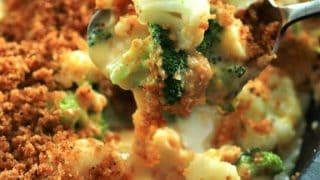 It is one of my favorite casseroles and it is so easy to make, Broccoli Cauliflower Cheese Bake. The cheese sauce is created on its own in the casserole. You just cut up cubes of cheese and viola, it couldn’t be easier!! This is a great side dish for Thanksgiving or the holidays!! 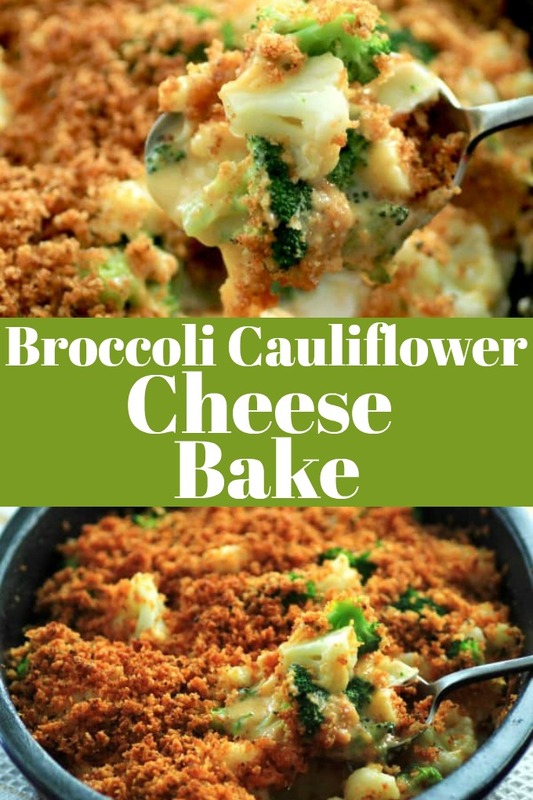 I love the combination of cauliflower and broccoli together. This is the only time I have used Velveeta in baking and I have to say it works great. Maybe not the healthiest of choices but “everything in moderation, including moderation,” said Julia Child. You can make your own cheese sauce but for little effort this dish makes its own sauce. 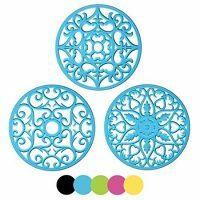 If it is for the holidays then you can splurge a little! But there is lots to love about this recipe! Perfectly done veggies that are first blanched for 3 min. and then shocked in cold water. This technique ensures that they keep their color and texture. Then a cheese sauce that is created on its own in the oven. Lastly, a slightly spicy, crunchy gorgeous topping that just completes this dish perfectly. I have brought this dish to a few potlucks and it completely has disappeared. 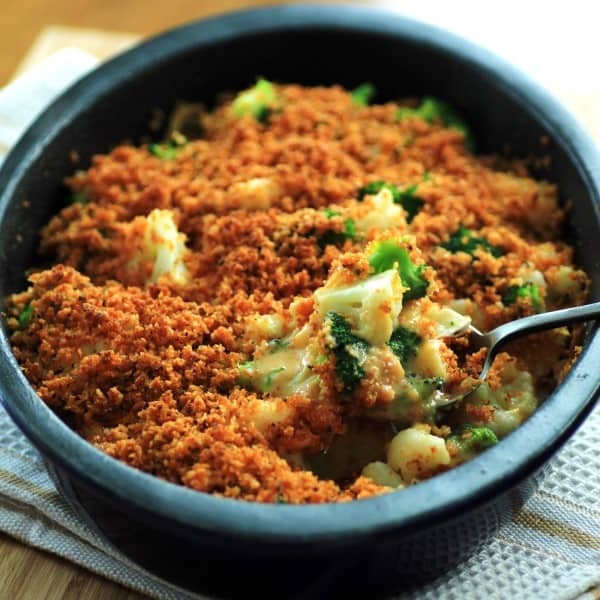 Everyone loves a cheesy side dish like this and if you use gluten free panko crumbs even more people can enjoy it. This dish goes with turkey, ham, roast beef and even fish. 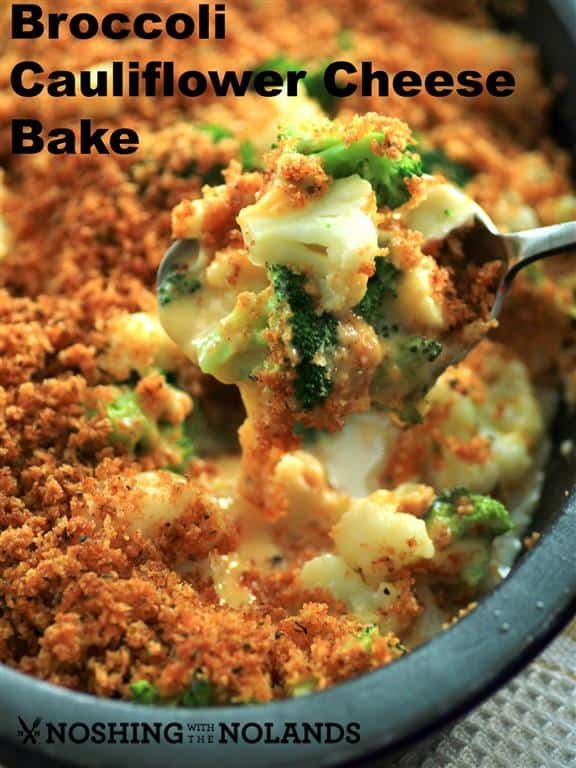 It can be easily made as a weekday casserole as it can be special for the holidays too! 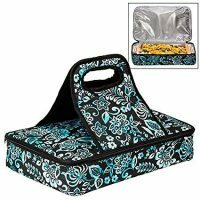 It is completely portable and just needs to be heated in a hot oven. This dish is nice also because it is just vegetables and doesn’t include rice which I find to sometimes be too filling with a big dinner. 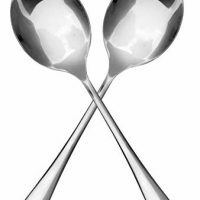 This makes a small 8×11″ pan but you can easily double it for a larger crowd. An amazingly easy and delicious side dish for Thanksgiving or Christmas! Preheat oven to 450F. 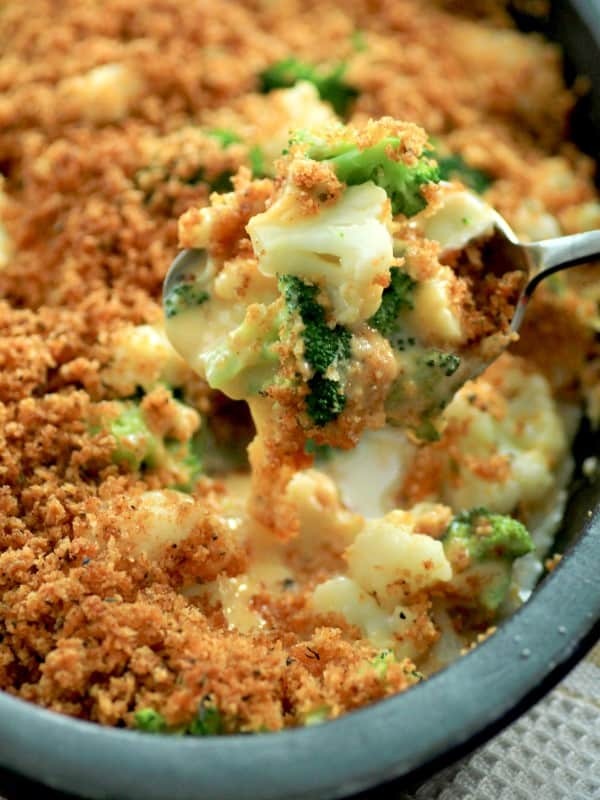 In a medium sized casserole dish (8x11") sprayed with cooking spray, add the broccolli, cauliflower, Velveeta and Camembert. Top with the panko crumb mixture. Wrap with foil and bake for 15-20 min. Tara, these are absolutely yummy! cant wait to try this. Oh yeah!!! This recipe looks perfect actually! Great job!! Thank you so much Susie, it is so easy!! I totally get it if it disappeared so quickly. It just so good and the combination are amazing. My idea of a perfect dish! Love this! What a gorgeous dish Tara! Can’t wait to try this for my Xmas eve dinner!! How much does it serve? I have 10 people to feed. Also, what size casserole dish, 9×13? Camembert is a cheese similar to Brie, should be able to find it in any grocery store. for this recipe. Can’t wait to try this soon. Can you freeze this dish? If you can, how long would you reheat? I don’t want to have to do any cooking Christmas Eve, but, don’t mind throwing something in the oven to heat it up. This sounds “yummy”. I freeze a lot of things but I don’t think this one would fair as well as others. I would have everything prepped and ready for it. Get ready the panko topping in a little bowl and set aside, covered. The broccoli and cauliflower washed, chopped and in a bag. You could even prep the cheese and then toss it together quickly on Christmas Day. Can you use frozen vegetables? If so, how does that change the directions? I would blanch them until just hot through, like 2 min. Also, I am pregnant and cannot use camembert cheese. Any substitute suggestions? I would put in something that melts easily also like a havarti. How much of this can be done a day ahead?? I’m making this for Christmas Eve dinner and want to get a head start. Thanks! You can have your topping made and in a container, your veggies prepped and your cheese cubed. Havarti would be great too for sure!! Merry Christmas!! How well do you think gouda would do? Hmmm, not sure, both of these are very soft cheeses but you could try. The Velveeta makes a sauce on its own. Do you make your gluten free Pablo bread crumbs or buy them somewhere? You can buy GF panko bread crumbs. Good question, I have no idea as I have never done that before. If you are making it for Christmas I would do a trial run for sure. Can the Velveeta be substituted and if so, for what? Thanks. You make a traditional cheese sauce instead of the Velveeta. Sorry, but I’m the type of cook that literally follows instructions word for word. What’s a “traditional cheese sauce”? Thanks. https://www.bbc.co.uk/food/recipes/cheesesauce_1299 Here is an example. I make mine using 2 Tbsp. butter, 2 Tbsp. flour, 1 cup milk and 1 cup aged cheddar. You can add a small pinch of cayenne to this and white pepper. Hope this helps. First time cooking with Camembert. Did you cut the Camembert into chunks, with or without the rine? Always leave it on, it is completely edible and delicious! This recipe is good but I found the topping was WOW way over the top peppery, the recipe calls for 1 tsp black pepper!! If I make it again, I would reduce the pepper alot and also just do a couple pinches of the cayenne pepper. It does get a heat from both of those peppers. You can always adjust it to your liking. Hi, I am very new to cooking. Is the Velveeta cheese a block of cheese you find in the cold cheese section? I am having a hard time finding this. Thank you! Yes, it is a large block bigger than cream cheese but should be around that area some where. Hi, I am very new to cooking. Is the Velveeta cheese a block of cheese you find in the cold cheese section? I am having a hard time finding it! Thank you! At my local Walmart, they have The Velveeta near the pasta and sauces area. Can I just use velveeta cheese? Don’t have camberant cheese. I made this for Thanksgiving & found that the Velveeta cheese did not fully melt & as a result gave this dish a gross taste. Any tips to prevent this from happening? Would really love trying to make this dish again for Christmas. Make sure the oven is at 450F. That your cubes of Velvetta are small and that you keep it in the oven long enough to get melted.